Now reduced in price and excellent value for money ! Designed by Angus Primrose the Moody 30 was very successful with over 150 built. This one is in very good condition having been well looked after during its life. Only lightly used in recent years, she has been upgraded and maintained to a high standard including a full set of modern instruments. An excellent family yacht with six berths, ready to sail away. 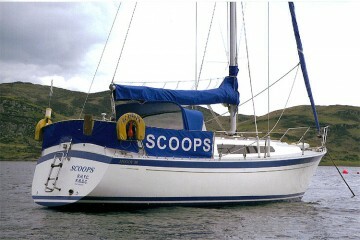 Forward cabin with v berth and infill giving double or two single berths. Saloon with double to starboard and single to port. Quarter berth. Flavel Gas Cooker, cool box, sink. Main (Saturn)- slab and roller reefing - easily switched between both. Silva depth, wind and speed. Navman Plotter. 12 volt, 2x110ah batteries with 1/2/both isolator switch. Spray hood and dodgers new in 2002. Volvo engine and sail drive fitted in 1991. Service manuals for engine and electronics.